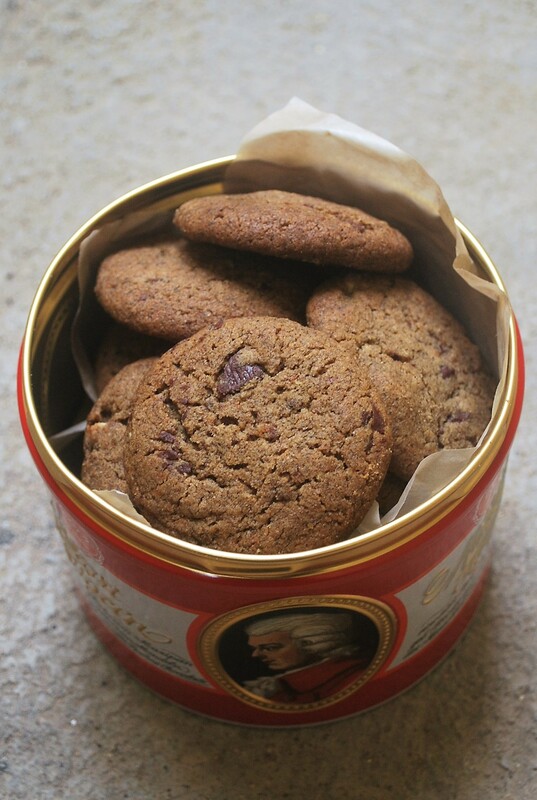 Chocolate chip cookies are one of the most popular cookies. I’m sharing with you a little healthier version of choco chip cookies by using unrefined flours like buckwheat and whole wheat flours. We are using butter in this recipe but if you want, you can use coconut oil instead. I’ve added some tiny bits of nuts along with chocolate to give my cookies some crunch. It is an easy recipe and I hope you give it a shot! Measure all the dry ingredients and keep it aside. Add butter, sugar and beat to a smooth consistency with the help of a whisk. Add an egg and beat further until mixed well. Add the dry ingredients to the wet mixture and mix well until well combined. Roll the dough into 1” balls. Arrange on baking sheets lined with parchment paper. Bake in pre-heated oven (@ 180 centigrade for about 18 to 20 minutes depending upon your oven settings. Once done allow it cool on a wire rack. Store in an air tight containers for about two weeks. I got 2 dozen medium-sized cookies.